This summer's $20,000 project in Pownal will give brook trout access to the Royal River's headwaters. 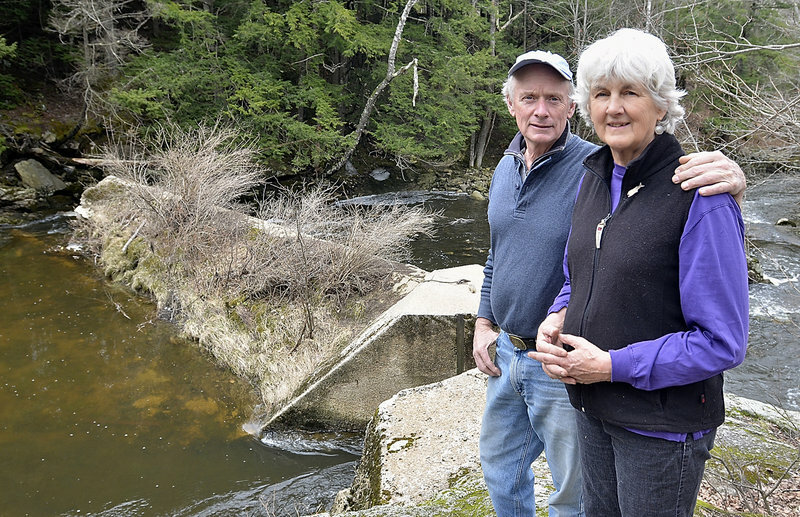 Two nature groups are making final preparations to remove a more than 200-year-old dam in Pownal that blocks the passage of fish along a tributary of the Royal River. Beginning as early as the 1790s, the Randall Mill Dam harnessed the clear, burbling waters of Chandler Brook, powering a lumber mill located near Lawrence Road. But the decaying stone structure has not helped hew a log or trim a board for more than six decades, and remains the only earthly evidence that a mill stood there at all. This summer, the Sebago chapter of Trout Unlimited will join with the Casco Bay Estuary Partnership to undertake a $20,000 project to disassemble the dam. “It is this remnant piece of 19th-century industry that does little except block fish,” said Alan Stearns, executive director of the Royal River conservation trust. The project is an example of the ongoing, sometimes daunting task of removing or correcting man-made blockages, dams, and culverts that prevent fish from finding refuge and safe passage throughout southern Maine’s network of streams, rivers and brooks that comprise the expansive 985-square-mile Casco Bay Watershed. Researchers at the Casco Bay Estuary Partnership spent two summers in 2009 and 2010 collecting information on the blockages, compiling detailed data on nearly 1,000 impediments to aquatic life, said Curtis Bohlen, the group’s director. About 40 percent of them are considered severe. In the Royal River estuary alone, 49 severe barriers were identified in the survey, nine of them dams, according to the study. In Pownal, the Randall Mill Dam is patched together with river stones and concrete, and was last rebuilt in the 1970s, when the short impoundment behind it provided for about 20 years a popular pond for swimming in the summer and skating in the winter. But the calm was broken in 1991, when Hurricane Bob brought several inches of torrential rain to New England. The overflow breached the structure, and it has not been repaired since. Unlike the muddy waters of the lower sections of the Royal River closer to Yarmouth, Chandler Brook, known as the middle branch of Royal tributaries, is a picturesque mountain flow. Opening the dam would allow brook trout and other aquatic life to have access to three more miles of stream and clear access to Runaround Pond, the Royal River’s headwaters. Unusual to the dam removal process is the close and enthusiastic participation of the area’s landowner, Fred Fauver, whose 35-acre property stretches along a couple of thousand feet on both sides of the brook around the dam. Fauver, who also sits on the board of the Royal River Conservation Trust, said he attended a meeting about 18 months ago to discuss the two larger dams near Bridge Street and Elm Street in Yarmouth. A scientific study has been under way for months to evaluate the impacts of removing those structures, results of which are expected in early May, according to the town. Fauver said he and his wife had for years dreamed of repairing the dam and rebuilding the saw old mill. When it was clear their vision was out of reach, Fauver said he approached Maine Rivers, another conservation group, about removing the roughly 20-foot-wide stone impediment. “We think that rather than having this relic sitting here as an obstacle, get rid of it and restore this section of the river,” said Fauver. Steve Heinz, conservation chairman for the Trout Unlimited chapter in Sebago, said his group has pledged half of the removal cost — $10,000 — and also has spearheaded the extensive permitting process required to remove the dam, meeting with an official from the state Department of Environmental Protection at the wooded site last week. Heinz said the removal is scheduled to take place between July and September before fish spawn in October, depending on the weather and rainfall this summer.